Today's strike is designed to pressure the president to use his executive authority to raise labor standards for federal contracting. Two updates, including news of a letter from congressional Democrats to the President, and of a planned meeting between the GSA and Good Jobs Nation, appear below. Beginning at 8:30 this morning, non-union, federally contracted workers plan to walk off the job at the Ronald Reagan Building and Old Post Office Pavilion in Washington, DC. Today’s strike, and a “mock trial” and pair of civil disobedience actions planned for this morning, are designed to highlight alleged “wage theft,” and to pressure President Obama to use his executive authority to require higher labor standards for federal contractors. The work stoppage follows a previous one on May 21, and a recent wave of similar one-day strikesby non-unionretail and fast food workers around the country. “The salary they pay isn’t good enough for us to live,” Reagan Building Subway worker Karla Quezada told The Nation in Spanish last night. 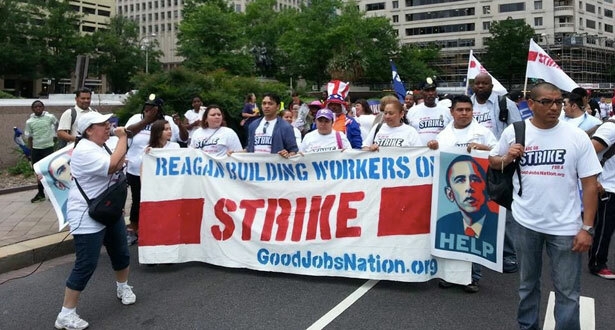 As The Nation has reported, the federally contracted worker campaign is being organized by Good Jobs Nation, a campaign unveiled in the spring and backed by the Service Employees International Union and other labor and progressive groups. A May report from the progressive think tank Demos estimates that about 2 million workers whose jobs are backed by public funds are paid $12 per hour or less. While The New York Times reported in 2010 that the Obama administration planned to announce a “high-road contracting policy” that would make it harder for companies with lower labor standards to secure federal contracts, the White House has made no such move. A spokesperson for the federal Office of Management and Budget (OMB) did not respond to requests for comment regarding the workers’ actions and allegations, including an inquiry yesterday. In a statement reported by The Washington Post, the GSA responded that it “takes steps to ensure that our contractors follow the law, and we take allegations of violations seriously.” The Post noted that a GSA spokesperson “did not answer questions about the agency’s processes for ensuring contractor compliance with federal labor laws.” A spokesperson for the federal Department of Labor told Reuters last week that the department “has an open investigation of Trade Center Management Associates providing services at the Ronald Reagan building.” Congressman Ellison, CPC Co-Chair Raul Grilajlva (D-AZ) and DC Congressional Delegate Eleanor Holmes Norton have also written to the GSA regarding contractors’ compliance with the law. Like the May 21 strike and recent fast food and retail work stoppages, organizers contend that today’s action is an “Unfair Labor Practices strike”—a protest inspired by violations of labor law, whose participants could therefore qualify for greater legal protection from being “permanently replaced” by management. Good Jobs Nation has filed National Labor Relations Board charges against four employers alleging illegal surveillance, intimidation and retaliation. As The Nation reported in May, organizers alleged that managers at four Reagan building food court outlets initially refused to let ten workers return to work after their strike, but relented following an emergency protest. Quezada told The Nation that her manager denied her and her fellow strikers two days of work as punishment for striking. And organizers say that after going on strike, three-year employee Antonio Vanegas was detained by Homeland Security, held in Immigration and Customs Enforcement custody for four days and separately fired by Quick Pita—ostensibly for failing to prepare a sauce on time. Vanegas has an immigration hearing next month. “I think SEIU’s approach is a good approach,” Donald Cohen, the executive director of In the Public Interest, told The Nation in a June 21 interview. A project of the Partnership for Working Families focused on privatization and contracting, ITPI is backed by major unions including the American Federation of State County and Municipal Employees, the largest public sector union in the AFL-CIO. (SEIU, which represents public and private sector workers, is the largest union in the rival Change to Win federation.) Cohen said he’s confident that some of the 2 million jobs cited by Demos should ideally be performed directly by public employees. But while “we would like to start moving things back in” to the direct federal workforce, said Cohen, “we’re also realistic: we’re not going to double the size of government right now.” Cohen told The Nation that “good contracting” rules that “raise the standards to where they should be” also weaken the case for privatization by making it harder for private contractors to under-bid federal employment on labor costs. Update (3:20 PM Tuesday): According to Good Jobs Nation, nearly fifty workers are on strike today, including about half of those employed in the Reagan Building food court. The campaign says that about thirty workers from those locations participated in the previous strike. In an e-mailed statement, Trade Center Management Associates said that it "does not hire or employ the employees of the businesses operating in the food court, and their wages are determined by their employers." TCMA added that its license agreements with food court vendors "oblige vendors to comply with all applicable laws," and that "if the allegations asserted in the complaint by Good Jobs Nation are investigated and validated by the Department of Labor, then TCMA will consult with the GSA, as GSA’s trade center manager, on the appropriate steps to be taken." Update (4:40 PM Tuesday): According to the GSA, Administrator Tangherlini has agreed to hold a meeting with Good Jobs Nation in the near future. In a letter sent to President Obama today, seventeen congressional Democrats urge executive action on contracting standards. Citing meetings with workers as well as Demos' report, the representatives call the capital "the visible epicenter of federal collusion with vendors and contractors that pay low wages to their employees at federal sites." "Although these contractors enjoy the prestige and get revenue at prime federal locations," they write, "the federal government washes its hand of these workers, leaving them with exploitative wages." The signatories, including CPC Co-Chairs Keith Ellison and Raul Grijalva, Chief Deputy Democratic Whip Jan Schakowsky, and freedom ride veteran John Lewis, ask the president to "take immediate action." "A working group of federal agencies," they write, "could extricate the federal government from its complicity in denying these workers decent wages and benefits." The Democrats note the "ample precedents for using federal contracting power to promote the general welfare," and suggest that a working group could "offer new approaches"; they offer the example of awarding potential concessionaires "significant points" in the contracting process if they offer a "living wage." In GSA's letter to TCMA CEO John Dew, sent on June 26 and also provided to The Nation this afternoon, Contracting Officer Michael Vrobel states that the agency "take[s] these allegations of violations very seriously." Vrobel writes that the GSA "expects that TCMA will comply with all applicable laws," and "will cooperate with Federal and State agencies responsible for enforcing labor requirements." Vrobel adds, "In accordance with TCMA's licensing responsibilities, please ensure that licensees meet the terms of the license by complying with all laws relating to the premises and the Licensee's use thereof." A spokesperson for the Office and Management and Budget did not immediately respond to an inquiry this afternoon regarding the congressional letter, and has not responded to prior inquiries regarding the contracted workers' allegations and demands. BART workers in San Francisco are striking for the first time in sixteen years. What does this strike have in common with last year’s Chicago Teachers Union strike?